I decided to stay at El Conquistador Resort in Puerto Rico based on readers’ suggestions, and with its stunning views of the Atlantic Ocean and Caribbean Sea and easy access to the El Yunque Rainforest, I couldn’t resist. 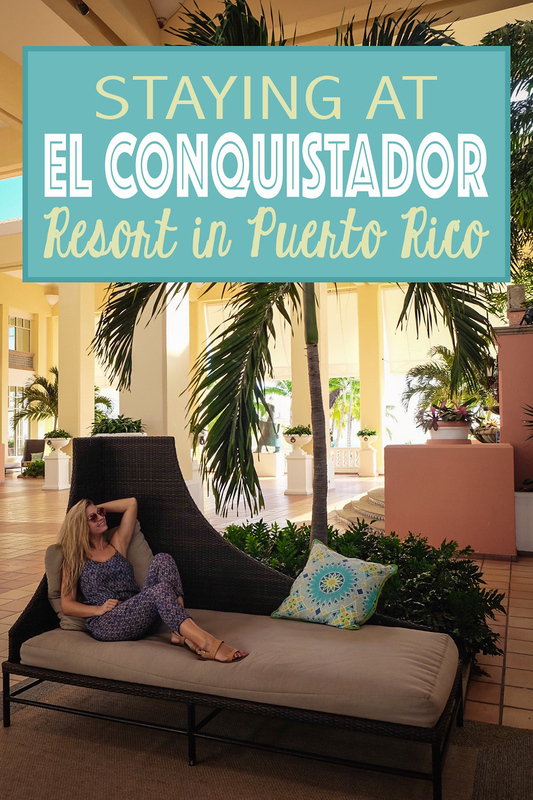 Here are the highlights of staying at El Conquistador Resort in Puerto Rico! The resort is quite expansive with over 980 rooms, and 22 restaurants and lounges, including fun poolside cafes. 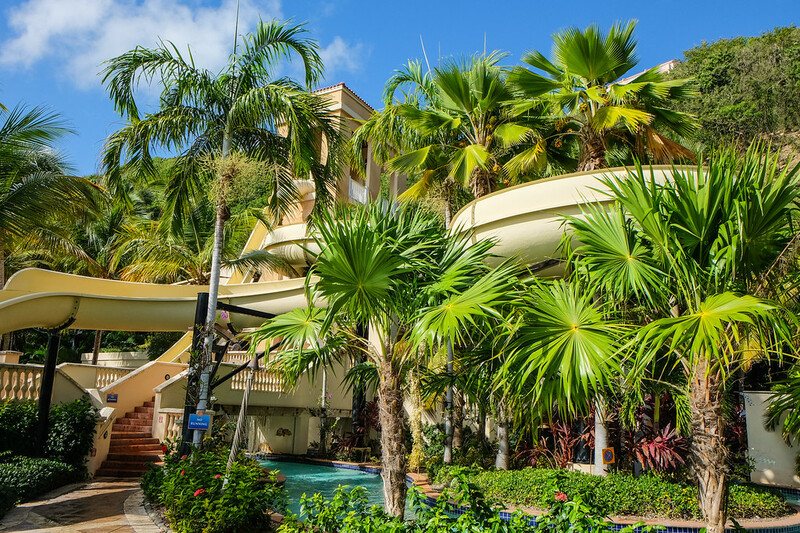 The resort contains the Coqui Water Park that includes a lazy river, infinity pool, speed slides and kiddie pools, that the whole family can enjoy. The property is also home to the Arthur Hills golf course, and the luxurious Waldorf Astoria Spa that- wait for it… has rainforest views! The highlight of the resort for me was the resort’s private island oasis- Palomino Island. Just a short boat ride away, you can enjoy snorkeling, horseback riding or just lounge on the white sand beaches! The accommodations at El Conquistador Resort are split between five villages on the property, and are quite impressive. The resort has a great mix of ocean front and garden view rooms, with private balconies, as well as queen, king and deluxe rooms. We had an ocean front view with a beautiful patio which was decorated with a tropical theme, and located in the main hotel! In addition to the pools, Palamino Island and the Coqui Water Park, the resort is very centrally located to other destinations on the island. It has easy access to the Bio Bay- famous for its nighttime bioluminescent kayak tours- as well as El Yunque Rainforest. Less than a 10 minutes drive from El Conquistador Resort are the tours for kayaking the Bio Bay. It’s an incredible experience to see the water sparkle like fairy dust as you navigate your way through mangroves lit by the moonlight. El Yunque Rainforest is located in northeastern Puerto Rico and is a beautiful nature experience. There are day tours, but the park is open to the public, so you can drive through and stop at different points to hike some of the trails. Don’t miss Coca Falls or Mina Falls – they’re must-sees in the rainforest! Ceiba Airport is also a short drive from the resort and services daily flights to the islands of Vieques and Culebra. If you can afford the time, book a day trip to soak up the sun on Flamenco Beach on Culebra Island. It’s consistently ranked one of the most beautiful beaches in the world! HELPFUL TIP: El Conquistador Resort has an onsite Enterprise car rental office so you can easily rent a car for the duration of your stay to explore the island. I highly recommend renting a car if you want to see and do a lot on your trip. As a Waldorf Astoria Resort, El Conquistador Resort has many services and amenities for every kind of guest. The Waldorf Astoria Spa offers relaxing services focused around health and wellness, and includes treatments like- my favorite- an invigorating eucalyptus-infused steam room! The spa also has a Japanese bath, lounges, whirlpools and rainforest views, and boasts a body treatment using herbs and plants grown on the resort’s organic garden. We spent a few hours getting pampered and browsing their boutique. I found this resort to be very family-oriented with the Coqui Water Park on property, which is great for those traveling with kids. They also have a a kid’s camp with outdoor activities, and babysitting services for that special date night!